We will be replacing our fleet of rental bicycles in the Peninsula store at the end of this season, so we will be offering the old models for sale to the public. We will have 37 '08 Raleigh Venture 4.0 bicycles for sale, with men's frame sizes of 14, 16, 18, 20, and 22 inches, and women's frame sizes of 16 and 19 inches. We also have 4 '08 Raleigh Mountain Scout 24-inch wheeled kids' bikes, and 6 Electra Townie 3-speed comfort bikes (3 men's and 3 women's). The Venture 4.0 and Townie models will be sold for $225 each; the Mountain Scouts for $175 each. We will NOT be selling any of the rental tag-alongs or Burley trailers. Beginning on September 1, 2009, visit the Peninsula store. We will help you select the model and size of bike that you want. 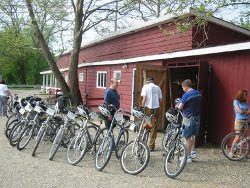 We will continue to rent the bicycles for the remainder of the season; exact timing will be dependent on the weather. After our final rentals, we will give every bike our standard full tune-up to be sure that each is in good working order. We will call each customer when their bikes are ready to be picked up, most likely around the beginning of December. Availability of the used rental bikes is on a first-come, first served basis beginning on September 1.